I was, oh, so young 13 years ago when I first started teaching--I didn't realize how young. My parents would be quick to say that I still don't realize how young I am. But my son--he thinks I'm old. So do my students. So, when I first started teaching, I was going to change to world. I was an English teacher. I was there to teach students to analyze, to write, to think. And I was on a crusade. They will learn--truly learn--on my watch. But then reality set in. I started teaching world history and was horrified to hear the guys brag about how quickly they could run through the curriculum. "Oh," I said one year later. "That's how." The standards...the tests...the interruptions...oh, my. Barring snow days and assemblies, there is still not enough time to teach the history of the world in 18 weeks. Content does, in fact, matter, and in this day and age of standardized testing, it matters more than ever. There are materials that we simply have to cover. But where is the time? And how do we pick what to dwell on and what to let go? Every teacher must come to a point when they have to decide what really matters. I'm on a journey, and don't pretend to have all the answers, but at this point in my career, these are the things that matter most to me. Thanks to Jackie in Room 213 for hosting this secondary link-up! What Matters Most (to me)? 1. Instilling a LOVE of History. There's no trick here, but if students get as excited about history as I do, perhaps they will dig deeper and continue to learn, even after the semester is over. History is stories. It's people--their daily lives, their ideas, their creations. So I try not to approach it from a kings and wars, names and dates angle. I use a cultural approach that you can read about HERE that helps present a whole, relevant picture of history. 2. Making History RELEVANT. 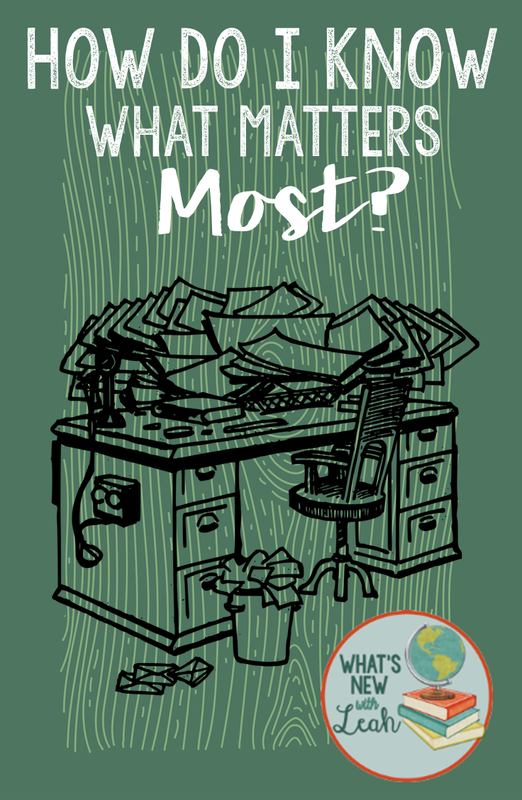 We may not have time to discuss every little thing that I or the standards consider important, but I make a conscious effort to connect what we do learn to their lives--to current events that are occurring today. For example, if we're studying a unit on the Enlightenment and Revolutions, students will find news articles about revolutions that have occurred within the past year, and find a connection between those revolutions and the ones we are studying. I have a handout, rubric, and example of this that you can get HERE. 3. Approach the Course with a THESIS. A thesis for the course brings unity and purpose. It helps me avoid the pitfall in history education of just throwing a bunch of facts at the students. My world history thesis? Change is a constant force in the world. We trace the force of change as a progression toward democracy and equality. We see disruptive forces in that change, but ultimately conclude that if we are to see the progression through, positive change doesn't come in large, political strokes, but from the actions of individuals. We begin the course with the story of the Hebrews and Israel. Diaspora is a theme throughout the course. The last lesson that I teach as of this post is of the Israeli/Palestinian conflict. It seems insurmountable. So little progress has been made politically. But then I show them this clip from the documentary Heart of Jenin. It's the story of a 12 year old Palestinian boy killed by Israeli soldiers in the West Bank. Instead of calling for vengeance, the father of that boy donates his son's organs to children in need throughout Israel. The documentary is the story of his journey to meet the children who are alive because of his son's death. I try to avoid telling my students what to think. But it's my hope that they conclude that positive change in the world occurs through the decisions and actions of individuals just like them--not through kings and wars. Which leads me to what really matters--that my students learn to take evidence, draw their own conclusions, and ultimately become positive actors in the continuing story of our world. 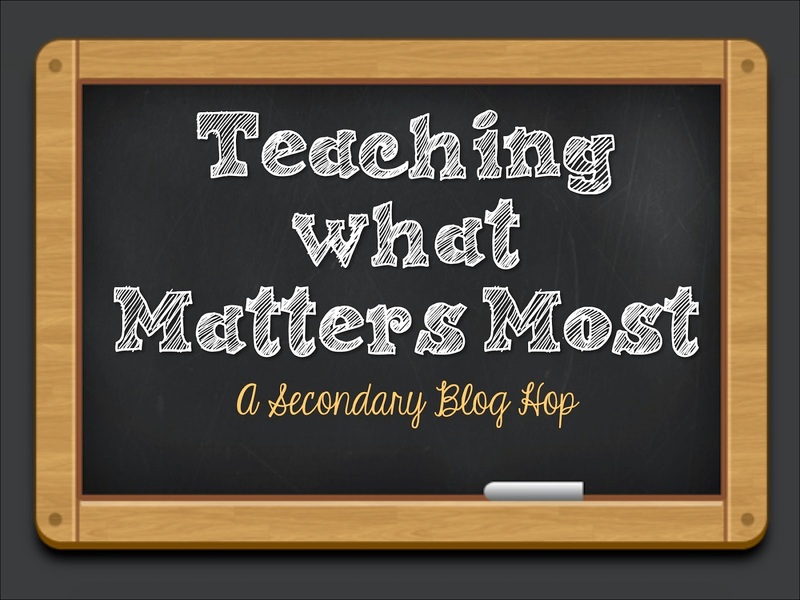 How do you teach what really matters? Leave a comment below and let me know. Yes, Michele--I would love to team teach a course with you! It's a very moving film. I love it. Thanks for the shout-out to my design #crayonbox :)! Thanks, Lauralee--life's a great-big-dissertation. :) Can't escape those English roots! I'm a thesis lover too--you have to have purpose otherwise you're wandering aimlessly. I'm going to check out that video too--so important to show our kids that there is good in the world, despite what we see in the news all the time. I agree, Jackie. If Anne Frank could see the good in others, what's stopping us? I do a similar concept as your thesis with my senior dual students. I call it a theme, but we relate all reading and writing to it, and it certainly makes the year have a purpose and plan. That sounds like a great class, Julie. Connections are so important! I'd be a student in your classroom in a heartbeat! It's clear that you love your work...the core of all wonderful teachers! Thanks for sharing! Thank you. That's such a sweet thing to say! Leah, I can tell that you ARE changing the world. And The Heart of Jenin sounds wonderful; thank you for introducing it to me!